High-heeled shoes help give the illusion of longer, slimmer legs. Sometimes, however, the impracticality of heels that are too high outweighs their benefits. Other times, if the heel is too short, legs don't look long or slim enough. Luckily, in these case there are options and you can adjust the height of your heels. But adjusting shoe height is a risky business, and should be done only by a cobbler. 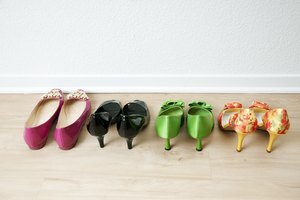 For those who want make their pumps taller, take them to a shoe professional to determine if it can actually be done. If you'd like to shorten your heel, you can figure out how much height can feasibly be removed from your heel right from home. How much can my heel be shortened? Place your high-heeled shoe on the end of a tabletop so that the heel hangs over the edge. Lower the heel until the back end of the ball of the foot touches the table. The part of the heel that hangs below the tabletop is removable. Take your shoes to a reputable shoe repair shop. If you performed Steps 1 and 2 correctly, the cobbler’s approximation of how much the heels can be shortened should closely match the table test results. Altering heel height changes the structure and balance of the shoe at any length. It is rarely feasible to remove more than one inch from a heel. Based in Aspen, Colorado, Larry LaVigne has been an editor at "Aspen Magazine" since 2008. He has written and edited pieces on virtually every topic—from fashion and lifestyle to politics and law. LaVigne obtained a Juris Doctor from the University of Connecticut in 2007.